With a savvy entertainer in the White House, we need to really understand how entertainment works, and wield that knowledge like a flaming sword on a windy but beautiful hilltop. What makes a hit show? What makes a bomb? 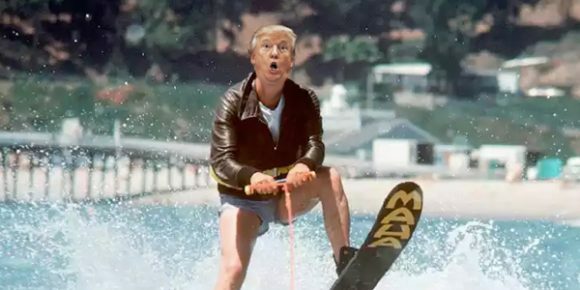 And how can we help the Donald Trump show “jump the shark”? In this episode, we talk to long-time screenwriter (Madmen, Smash) and activist Jason “Hollywood J” Grote and find out what artistic activists can learn from Hollywood. – The end of LOST was a lazy mess, but experts say the end began with the flash-forwards in Season 3, when a beloved and weird idea was stretched to its breaking point. – There are those who say that the Star Wars: Rogue One movie was the one that stretched the basic Star Wars plot too thin, but we can’t help but love it. Phantom Menace, on the other hand, may tell us something about the boredom that could set in when Trump has to deal with actual policy. – Roseanne was a working class icon until she won the lottery. It was all downhill from there. Perhaps we don’t want our heroes to have it quite so good. – And of course, Happy Days, where it all began. There are lessons to learn here, so we can spot and exploit the critical moments when the fictions spun by the new administration reach a breaking point.